While the proposed rule, as published, does not specificallyreference standards development and/or test procedures under section 413 of the Energy Independence and Security Act of 2007 (42 U.S.C. 17071) directly pertaining to manufactured homes, the proposed rule does, by its terms, apply to DOE’s Appliance Standards Program — the same program under which the original proposed DOE manufactured housing energy standards rule (published June 17, 2016) was developed and subsequently modified by DOE pursuant to a Notice of Data Availability (NODA) published in the Federal Register on August 3, 2018. 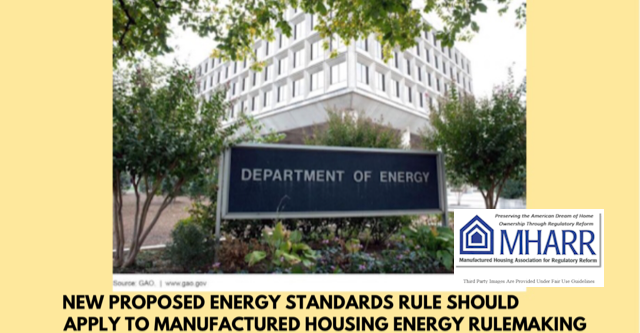 Industry members will recall that the manufactured housing energy rule had not substantially progressed at DOE until a segment of the industry, together with energy special interests (and DOE) in 2014, sought and engineered an illegitimate, truncated, dysfunctional “negotiated rulemaking” under DOE’s “appliance” rulemaking process, as a fig-leaf designed to achieve a pre-ordained result. Given that the proposed (and still pending) DOE manufactured housing standards were developed under DOE Appliance Standards Program procedures that areaddressed by the changes proposed in the February 13, 2019 DOE Notice, MHARR will file comments with DOE seeking to have the procedural modifications noted in the proposed rule applied to the manufactured housing proceeding, which would constitute yet another basis (among many others previously detailed by MHARR) for the withdrawal of any and all previously-proposed versions of the DOE manufactured housing standards – developed under or derived from — the inherently tainted DOE “negotiated rulemaking” process, and the ultimate development of a new rule based on a legitimate and lawful standards-development process consistent with the regulatory policies of the Trump Administration. Among other things, the February 13, 2019 proposed rule would: (1) expand various procedural protections to test procedure rulemakings for regulated products; (2) define “a significant energy savings threshold that must be met before DOE will update an energy conservation standard;” and (3) “clarify DOE’s commitment to publish a test procedure six months before a related standards [Notice of Proposed Rulemaking].” This is particularly significant in relation to DOE’s proposed manufactured housing energy standards, insofar as proposed test procedures were not published by DOE until afterpublication of the June 17, 2016 proposed rule, as was pointed out by MHARR at the time. Written comments on the proposed rule are due by April 15, 2019. MHARR will submit comprehensive comments (and participate in related meetings) in advance of the April 15, 2019 deadline and will make its comments available for reference by industry members. As always, MHARR shall keep you apprised of any new developments in this matter.